Do you know how clean your tap water is? The answer to that question can vary drastically depending on where you live – but it’s always a good one to ponder. Drinking water is often contaminated with organic matter, minerals, chlorine and chemicals leftover from the water treatment process. If you want cleaner water, the easiest way to go about it is to get a filtered water pitcher. In this guide, we’ll help you find the best water filter pitcher for your needs and budget. There are a huge variety of good filtered water pitchers out there. To help our readers, we narrowed it down to just a top few through testing and research. We tested some models ourselves and looked at tons of water filter pitcher reviews to round out our own findings. Here are our recommendations! Using a combination of hands-on testing, internet research and third-party water pitcher filter reviews, here are the products we believe to be contenders for the best water filter pitcher of 2019. The Brita Everyday is a flagship model for Brita. You have probably seen Brita products on store shelves before, as they are definitely the leading brand in the industry. The Everyday is Brita’s entry-level filter, so it’s priced quite affordably while still offering the quality and efficacy that makes Brita products so popular. The Everyday is a simple yet effective water pitcher filter with a 10-cup capacity. It’s made with BPA free materials. The included filter helps to reduce the chlorine taste of tap water, and can help remove mercury, cadmium, copper, unpleasant odors and more from your drinking water. The pitcher comes with one Brita filter, which is good for around 40 gallons. 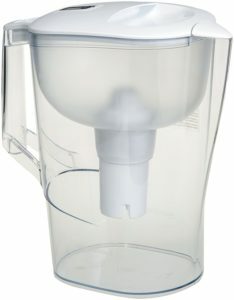 The pitcher is compatible with most Brita-branded replacement filters, including the popular Brita Longlast filter and the more budget-friendly AmazonBasics replacement filters. 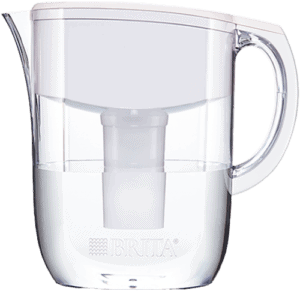 Click here to learn more about the Brita Everyday. For those on a tight budget, this AmazonBasics model may be the best water filter pitcher. It’s designed to offer a similar experience to the Brita Everyday, while saving customers a few bucks. The pitcher has a 10-cup capacity, and is made of BPA-free materials. Its affordable filters are good for around 40 gallons of water, and their lifespan can be monitored via the built-in electronic display. Filters are designed to remove chlorine taste and odor effectively, while also removing contaminants from your drinking water. Unlike some higher-end models, the replacement filters for this pitcher are quite affordable. One thing we noted about this model that was unique was that it’s almost completely transparent – even the holding tank. This makes it easier to see the water levels in both chambers, and to monitor for signs that it may be time for a cleaning. Overall, we found this to be an excellent product, especially considering the low price tag. Click here to learn more. 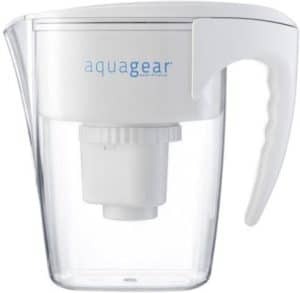 The AquaGear Water Filter Pitcher is an advanced water filtration system. It uses 5-stage filters that are certified and tested to NSF Standards for the removal of lead, fluoride and other contaminants. The manufacturer claims the filter can successfully remove 2000% more contaminants than standard Brita filters, all while keeping healthy trace minerals in your water. It has a unique lead/fluoride filter that most similar products do not have. Wondering which water filter pitcher removes the most contaminants? The AquaGear is your answer! AquaGear has earned excellent ratings in water filter reviews, and they stand behind their products with a lifetime warranty. They also support clean water charities to provide drinking water to impoverished populations without reliable access! The downside of course is that this pitcher costs 2-3x the amount of others on this list. The replacement filters are similarly expensive – though, they should last for 150 gallons vs only 40 for standard filters. Thus, the long-term cost of this unit is probably similar to cheaper models – especially when you factor in the lifetime warranty. Click here to learn more about the AquaGear. 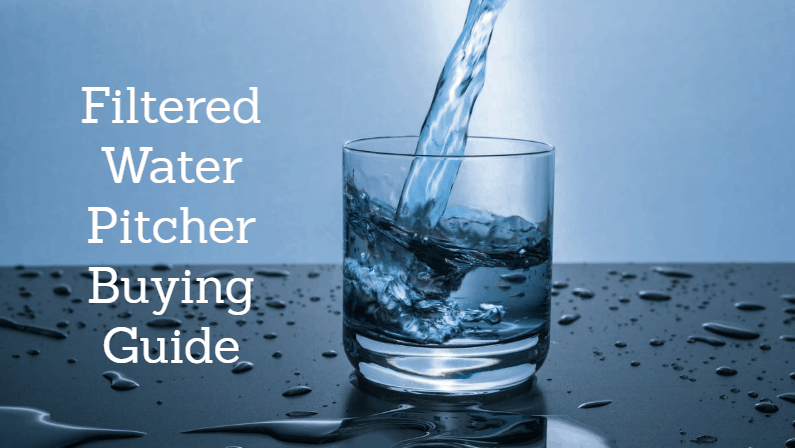 Better Taste – Water filters can remove chlorine, metallic-tasting minerals and other impurities that can affect the taste of your drinking water. Safety – Most municipal water systems do a good job of filtering out dangerous chemicals and contaminants – but we need only look at the ongoing water crisis in Flint, Michigan to know that’s not always the case. Home filter systems can help remove dangerous contaminants like bacteria, lead, pesticides, chemicals and more. Peace of Mind – Most tap water is treated in a number of different ways before it reaches your home. Adding one more filtration step – and particularly one you can control – may help give you some added peace of mind. It feels good to know that you’re drinking clean, fresh water! Hydration – A lot of us simply don’t drink as much water as we should. In some cases, a lack of good-tasting water may be contributing to this deficit. And considering there are tons of health benefits associated with proper hydration, anything that can help us drink more water is worth trying! Many folks like filtered water pitchers because they’re so simple. Just fill it up, throw it in the fridge, and pour some filtered water out when you’re done. On the other end of the spectrum, more advanced filters like whole-house water filters and reverse-osmosis filters tend to remove a greater proportion of contaminants, but are much more costly and difficult to install. Ultimately, the best water filter for you will depend entirely on your needs, wants and budget – as well as the contaminants present in your water. You may consider doing a home water test to see what contaminants are in your drinking water, before you settle on a specific filter. Capacity – Nobody wants to fill a tiny pitcher 3 times a day, so we focused on larger units with a 8-10 cup capacity (which should be enough for a day or two, depending on your household). Filter Design – The actual filter is more important than the pitcher itself, so we evaluated the efficacy of each filter type. We looked at how they were designed, what contaminants they were designed to remove, how quickly they filtered, and several other factors. Cost – We closely considered both the upfront cost and the ongoing cost (replacement filters) in our recommendations. With that said, it’s sometimes worthwhile to pay a bit more for something like the AquaGear, particularly if your water source is questionable. Reviews – We looked at lots of filtered water pitcher reviews to get a feel for what a wide variety of customers were experiencing. Water quality varies significantly depending on your location, so we found it beneficial to get a more broad perspective on the effectiveness of these filters in different areas.